Published on October 19, 2016 by Martyn. Be the first to comment! The 2017 Coventry Inspiration Book Awards were officially launched today by the children’s author and screenwriter Andy Briggs at a special event at the city’s Ricoh Arena. 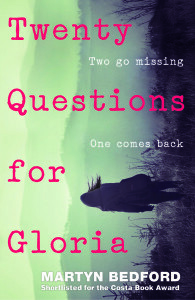 A total of 40 books for children and teenagers are competing for prizes in five categories aimed at different ages and reading levels – my latest YA novel, Twenty Questions for Gloria, has been shortlisted in the ‘Simply the Book’ category, for readers aged 13 and over. It’s the second time I’ve been in contention for this award, following Flip‘s shortlisting in 2012. This is the 11th year of the awards, which are run by Coventry City Council’s Schools Libraries Service. Hundreds of children aged from 4 to 18 at participating schools across the Coventry area will be able to read, comment on, review and vote for their favourite books over the coming months. The title from each category with the fewest votes will be evicted on January 23 and the books will continue to be whittled down every week after this until February 20, when each category will be down to the final three. After a final week’s voting, the winning books will be announced on March 1, to coincide with reading events being held in schools to celebrate World Book Day (March 2). All of the competing books were shortlisted by a panel of specialist children’s librarians and teachers and reflect a wide range of genres and styles. For full details of this year’s Coventry Inspiration Book Awards and to find out the shortlisted titles in the other categories, please click on this link to the awards website.